On Friday night in Egypt, then-president of Egypt Hosni Mubarak resigned from office and moved to the resort town of Sharm el-Sheikh. No flowery resignation speech, no final words, only an announcement from VP Omar Suleiman that he and the military would be taking power and helping to set up a new government. This is completely astonishing, considering that, only yesterday, Mubarak made it clear that he intended to stay in office. Though many are still unsure what exactly went through his mind between then and now, it seems to me like Mubarak finally realized something that I would’ve thought of much sooner: “Do I really want to spend the last years of my life trying to hold together a country in revolution? Wouldn’t I much rather spend it at a resort on the Red Sea?” Well, that’s why I think he threw in the towel. In all seriousness though, Mubarak’s resignation is a hugely significant event, not just for Egypt, but for the greater Middle East, and for America. Egypt has an opportunity to remake itself into the country it wants to be, but it needs to do things right, or it risks slipping again into the wrong hands. Like the French Revolution hundreds of years ago, this turnover of power has the potential to go bad. Now, I’m not saying that Mohamed ElBaradei is anything like Maximilien Robespierre, but there’s always the possibility that another corrupt government will fill the vacuum left by Mubarak. But I’m optimistic! The Egyptian people have shown their mettle over the last 18 days, proving that they simply will not tolerate the kind of state-of-emergency government established by Hosni Mubarak. In this author’s opinion, the Egyptian people have come too far to lose it all now, and there’s no way they’ll let another such government come into place. That said, there’s still quite a bit to take care of. Many of Mubarak’s “security-driven” measures, such as the permanent state of emergency law and the skewed constitution, still need to be axed and safely replaced, and that will take some time. Besides that, all of those in power (and hoping for it) need to be extremely careful to set up a system that not only facilitates free and fair elections, but works hard to make sure this can’t be reversed. There’s a lot of work to do. Egypt has finally gained the freedom it hoped for and deserved, and they must use it wisely. Having already become a beacon of hope to other oppressed peoples in the Arab world, Egypt must shine even brighter to show that they are certain to have a proud, democratic future. Egypt has been in turmoil for 11 days now. What started as smaller, peaceful demonstrations against Mubarak’s regime have grown exponentially to encompass the entire country. More than 2,000 American citizens have been evacuated from Cairo, and more on their way out. But things took a terrible and bloody turn on Wednesday. 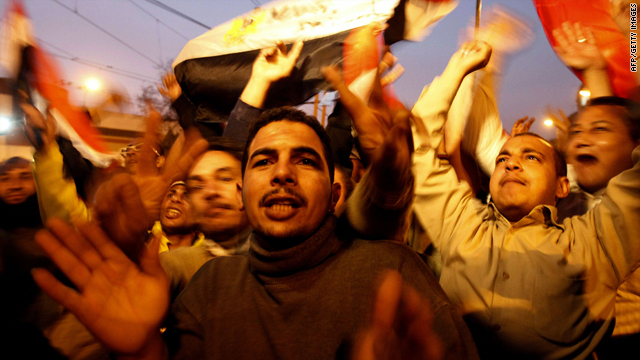 As thousands upon thousands of anti-Mubarak protestors assembled in Tahrir Square, near the center of Cairo, armed “supporters” of Mubarak began to enter the square as well, after disembarking from buses that pulled up nearby. The men carried chains, rubber hoses, knives, clubs and all kinds of other makeshift weapons. At first, they simply chanted in support of Mubarak. But, as if each of them were following orders, they all began attacking the anti-government protestors at 2:15 pm, throwing rocks, pieces of metal, and all kinds of projectiles. There’s little suspicion among the anti-Mubarak group that these men were what are called “baltageya,” plain-clothes hired arms for Mubarak. In a way, they’re mercenaries. After a while, the anti-government protestors began to fight back, returning the attacks against the mercenary protestors. The battle raged well into the night, eventually progressing to use of homemade firebombs and live arms fire. More than 800 people were injured and at least 8 killed. And the army just watched. While the government-sanctioned violence in Tahrir was atrocious (in fact, President Obama has openly broken ties with Mubarak’s Egypt), it’s really not all that surprising. At this point, Mubarak has huge amounts of pressure on him from all sides: The United States, other important countries like Germany, Britain, and France, and most importantly, his own people. The bloodshed on Wednesday was tragic, but it showed the dedication of the Egyptian people to their cause of democracy. They’ve battled through brutal riot police and now their own fellow Egyptians (hired thugs really), and many of the anti-government protestors have said that they’ll either get the democracy they want or die right there in Tahrir Square. That’s dedication. Mubarak’s already given significant ground to the protestors, but it’s not enough. It’s been made abundantly clear by the Egyptian people that his time is up, and they seem determined to keep the pressure on him until he steps down from power. It’s only a matter of time until his time is up. Further developments in Egypt! As you may have heard, the Army has been deployed in many parts of Egypt, effectively replacing the police. The problem with this, from Mubarak’s perspective at least, is that the people love the Army. The sentiment on the ground seems to be that the Army is taking the job of peacekeeping very literally, taking no aggressive action against civilians. Ironically, the heavily armed and armored military presence here is both more reserved and more welcome in Cairo than the notoriously violent police ever were. The Army here has pulled coups in the past, and it wouldn’t be particularly surprising to me if the very troops Mubarak called on to maintain order were the same ones to take him out of the office he used to issue that command. Many people (this author included) think that the ultimate decision about Egypt’s political future is in the hands of the Egyptian Army. Nearly 500,000 troops strong, and led by generals of uncertain motives en rie Mubarak, the armed forces here will be the tipping point in the next few days and weeks. I’ll be keeping an eye on things over there! PS! I’m posting a poll (which I’m guessing will get no responses cuz I don’t have readership yet) about whether Mubarak will remain in power! What do you think? For those of you who have been reading the news lately, things have gotten a little crazy over in the Middle East as of late. Starting in December of last year, Tunisia had a little uprising, one that ended badly for then-president Zine El Abidine Ben Ali, a vaguely creepy-looking head of a corrupt authoritarian government. Ben Ali had been funneling money to his extended family and spending huge quantities on his and their pleasures as the rest of the country foundered (similar to what Louis XVI pulled back in the French Revolution). This uprising (and overthrowing) in Tunisia was fairly alarming to other Arab leaders, as many of them led similar autocratic governments. And lo and behold, Egypt is foundering in political turmoil and civil unrest. The protests have spread not only to Egypt, but to Jordan and Yemen as well. Throw in the collapse of the Lebanese government, and you have a pretty big explosion waiting to happen. Now, the way I see it, there’s two ways to look at this. The first might be a bit stupidly optimistic (and I consider myself something of a master of stupid optimism), but here goes. The governments in many of these countries are notorious for their authoritarian rule. The country on everyone’s mind right now is Egypt, so I’ll focus on them for a bit. The president of Egypt, a guy by the name of Hosni Mubarak, has been in power in Egypt for 30 years. Even if the Egyptian people had the option to elect someone else, 30 years is an egregious amount of time for one person to remain in power without the option of ousting said leader. So you could look at these protests in that way: An eruption of anti-autocratic sentiment, when the oppressed people rise up against the oppressors and break their chains. Like I said, that’s the stupidly optimistic view. The other, more realistic view is of course more complicated. Egypt has always acted as one of America’s staunchest allies in the Middle East, a region full of pies that America has dug its fingers into. While one can hardly say that Mubarak’s police state is humane or “American,” we risk losing a firm foothold in that part of the world. There’s a lot of uncertainty in these protests. People want Mubarak out, but it would seem there’s not much of a plan for a replacement (though I’m sure many people will present themselves as candidates). 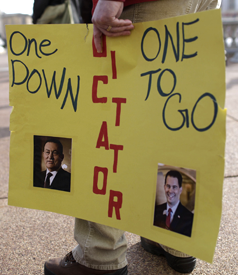 Chances are that if the government were to be replaced (and Mubarak with it), America would stand to lose a lot. But who knows? Maybe it’s about time we do.